Watch How to Make Avocado Tomato Cucumber Salad With Kiwi Dressing Recipe below (please wait for a couple of seconds for loading). Welcome to this ‘new’ week! Monday – bringing the beginning of this ‘new’ week. Beginning of some ‘new’ hopes, some challenges, some wins and some losses. Change is good, Oh yeah: Does new means change? Certainly. I often see that people get furious at first when you talk about something ‘new’. Some people assume that ‘new’ is gonna is be good, others think ‘new’ is gonna be bad. To me, the word ‘new’ is quite adventurous. ‘New’ means something is gonna change for sure, but change is not always bad. Not always better, but itâ€™s not gonna be the same as it was earlier, thatâ€™s for sure. Does new gives you anxiety? For some people, this ‘new’ might be a ‘new’ way of thinking, ‘new’ job, ‘new’ city, ‘new’ country or it might be be some ‘new’ food. Yeah, I have seen many people who are afraid of trying something ‘new’ when it comes to food. They are so comfortable with their existing food habits that they do not want to try anything ‘new’. Even a talk about trying ‘new’ food gives them anxiety. Yes, I have met these people in person. I think we all have. Love being a foodie: As a food blogger and a foodie, I am never frightened to try ‘new’ when it comes to food, like you all foodie people. After all how can someone claim that something is gonna be bad without even trying it. Right? For claiming it good or bad â€” we would have to try that thing first. And if you have been following my blog for quite sometime, then you would surely know that I never hesitate when it comes to trying ‘new’ flavor combos. And why should I hesitate, after all I am a foodie. 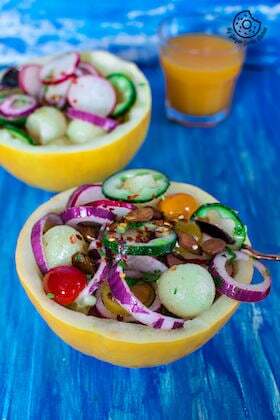 And this kiwi olives dressing which I am sharing today is one of such things which came out super awesome. Hey, wait! OMG, already half-way through this post, and I havenâ€™t yet introduced to you the energy boosting salad I am sharing today. tell about this AWESOME thing. So here I am with a salad which would make your Monday, and this is just a few minutes away from you. Wouldnâ€™t you love to have a salad which is restaurant-quality? Raise your fork if you want this salad! Oh no no no! I didnâ€™t mean you get this salad delivery right through your computer screen. You will have to get up first and walk down to the kitchen. And the rest would be taken care of so fast. Even before you realize anything, this so vibrant, fresh and delicious salad platter would be in your hands. Let your imagination fly: This salad is simple to make and super easy to customize! The marvelous thing about this salad is that you can toss in just about any bean you have at hand. Feel free to try it with chickpeas, pinto beans, black beans or even baked beans. This saladâ€™s awesomeness would remain the same. 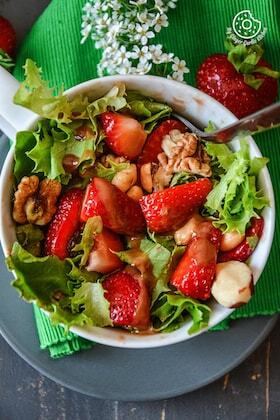 And I guarantee you, this easy, tasty and quick to prepare salad will surprise you with itâ€™s refreshingly unique flavor. It takes only a few minutes to peel and chop all of the vegetables. For salad I added tomato, cucumber, onion, avocado, cooked kidney beans and carrot ribbons. For dressing I used kiwi, black olives, olive oil, apple cider vinegar, salt and pepper. Tossed everything well. 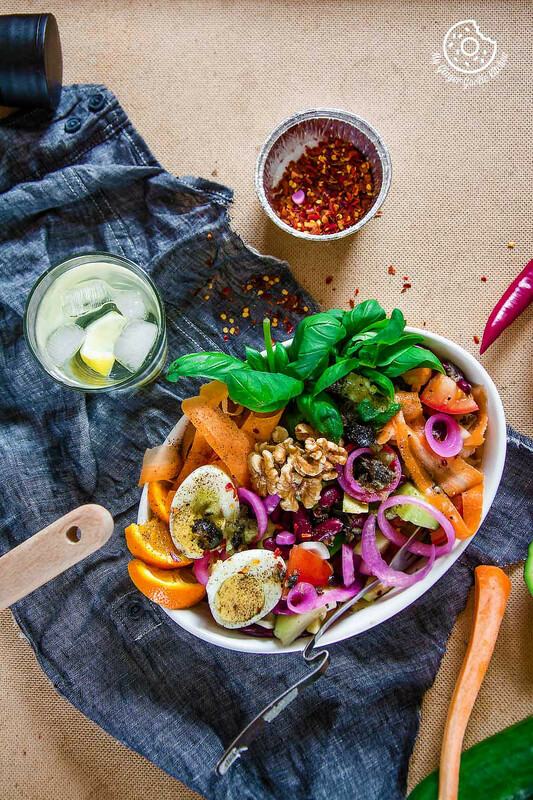 And served with fresh basil leaves, carrot ribbons, orange slices, boiled egg, pickled onions, walnuts and some more dressing. A sprinkle of some chili flakes, ground pepper. And Ta-da. The most exotic, most beautiful and delicious salad is ready. Believe me, it is spoon-licking good and full flavored. Donâ€™t you just love a mouth-watering dish which is quick, easy and can really rock and roll on a plate? I LOVE such meals. Combine all ingredients in a bowl and stir well. Set aside. Add tomato, cucumber, onions, avocado, carrot ribbons, kidney beans to a large bowl. Pour 3/4 kiwi olive dressing and toss to combine well. Arrange salad in a serving dish. Add basil leaves, orange slices, carrot ribbons, boiled egg and pickled onions. Pour remained kiwi olive dressing on top. Sprinkle chili flakes, and ground pepper. Editor’s note: This post was originally published in June 2016 and has been updated for comprehensiveness and freshness.